Although there is much happening in life and the world I would like to vent thoughts about, I’m under deadline on a book at the mo and employing mental and finger skills there, so the blog suffers. Squeezing the work in between one big job and another bigger one means I have only weeks to go from zero to done and I’m feeling the pinch. Add to that the fact that the weather is stunning and the beach beckons big time and composing blog posts jumps to the bottom of the to-do list. There is, however, time this lovely morning for a bit of H&H (Harvest and Harangue), so let’s get to it, shall we? UN Secretary General Ban Ki-moon urged the body’s Security Council to take “decisive action” over the Libya crisis. That’ll do it, heh? Sure … form a committee. Visitors to Tripoli would not hear gunfire but might hear fireworks, Mr Gaddafi said. One the “Hey, that’s kinda cool” front, a new theory on gravity has some pull this morning. A controversial theory that challenges the existence of dark matter has been buoyed by studies of gas-rich galaxies. Instead of invoking dark matter, the Modified Newtonian Dynamics theory says that the effects of gravity change in places where its pull is very low. Having experienced the wonders of Mexico’s rich history, this story on looting of historic sites there is disturbing. 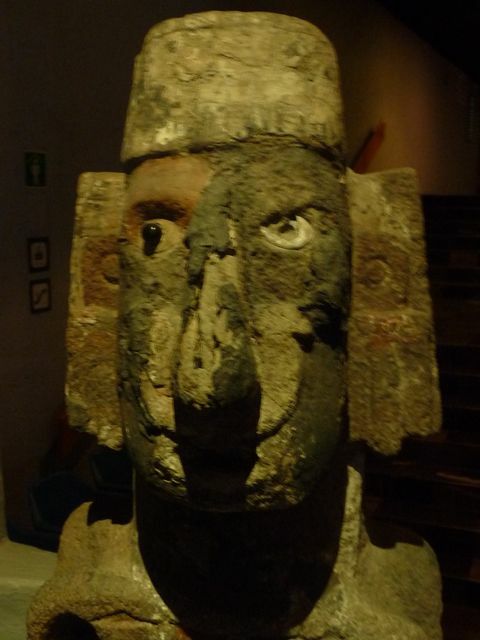 Mexico signed an international treaty in 1972 that prohibits the extraction and trade in archaeological artefacts, with punishment of up to 12 years in jail for such a crime. But, almost four decades on, experts say the demand from abroad for pre-Hispanic pieces, especially the US, shows no signs of abating. Not surprising since selling heritage has been a going concern all over the world, but still a regrettable loss … just ask the Greeks. I was recently introduced to the wonders of incognito British graffiti artist, Banksy, so was drawn to this program on him “leaving his social commentary” in L.A.. Very cool stuff. And speaking of things British, I can’t end this post without a mention of the Covent Garden restaurant now serving up breast milk ice cream. The dessert, called Baby Gaga, is churned with donations from London mother Victoria Hiley, and served with a rusk and an optional shot of Calpol or Bonjela.